Blue Masked Lovebird, Masked Lovebird, Agapornis personata var. A pretty little parrot, Blue Masked Lovebird makes an adorable pet. It is a most playful, charming and amusing companion...an excellent bird for the beginner! The Blue Masked Lovebird is a favorite color variety of the Masked Lovebird. Though easily bred in captivity, this attractive variation also occurs naturally in the wild. Friendly and easy to care for, the Blue Masked Lovebird will make a delightful and enjoyable addition to any household. They are relatively hardy and are easy to breed, making them every bit as good a pet as the Peach-faced Lovebird. Some even suggest that they may be a bit calmer, though others say they are just as mischievous. Typical of all the lovebirds, the Blue Masked Lovebird is very social and loves companionship. Their natural behavior is to live closely with a companion so are often kept with another lovebird. Though they make a very fine and affectionate pet when hand-raised, they will need a lot of attention if kept singly. Most are kept in pairs to satisfy their considerable need for constant companionship, mutual preening, and socialization. Scientific Name: Agapornis personata personata var. Description: The Blue Masked Lovebird is the best known color mutation of the Masked Lovebird, and this variety occurs naturally in the wild as well as in captivity. It is very attractive with a black head, blue body, and a white collar around the neck and on the upper breast. All the Masked Lovebird mutations have a black 'mask' and their names refer to their body coloring, in this case 'blue'. Other color mutations include the Green Masked Lovebird which is also very common, and other more uncommon varieties such as the medium blue (cobalt) and the dark blue (slate). Size - Weight: The Blue Masked Lovebird will get up to about 6" (14.5 - 15. 5 cm) in length. Care and feeding: A roomy cage is required as lovebirds are very active. If you have a tame pet that is kept in a small cage, it needs to be let out for extended periods to fly about. Your pet they will enjoy a variety of seeds, fruits, vegetables, and commercial pellets. See About Lovebirds: Housing and About Lovebirds: Care and Feeding for more information. Social Behaviors: A lovebird is a very social bird with it's companion, and it is generally thought to be essential for their good health and happiness that they be kept in pairs rather than singly. They can, however, be aggressive towards other birds in an aviary setting. Activities: Loves to fly, climb, and play. Provide lots of room and lots of toys. 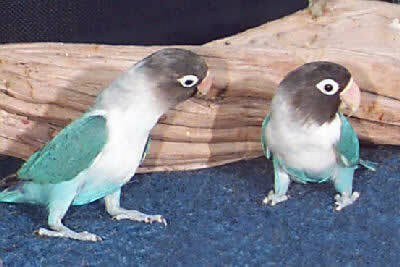 Breeding/Reproduction: The Blue Masked Lovebird is excellent for the beginning breeder. These birds will breed as either single pairs or in colonies, and have the same behaviors as the Masked Lovebird. When you provide them with a nest box be sure to also provide lots of willow twigs, strips of bark, or other nesting materials. The hen will lay three to four eggs which are incubated for about 21 to 23 days. The young fledge (leave the nest) in about 44 to 45 days. When they become independent, remove the young to their own housing. See About Lovebirds: Breeding/Reproduction for more information on breeding. Potential Problems: This bird has a high pitched twittering and though not as loud as some parrots, it can be rather noisy for parts of the day. See About Lovebirds: Potential Problems for information on illnesses. Availability: The Blue Masked Lovebird is very popular and is readily available. Asssalam O Alikum I would like to purchase blue masked lovebird ,Black ,violet. i have a blue masked love bird but I have never heard him speak is that normal ? Hi. I have a beautiful blue masked lovebird for adoption. Unfortunately, I don't have enough time to spend with her. Please email me if you're still interested. Hi--Is your blue masked lovie still available? Looking for a blue masked lovebird, preferably hand-tamed. I live in Calgary, AB. I just want the one, so that I can bond with it.